خانزاد بناب, سمیه, جباری, حبیبه. (1397). آلودگی برخی گیاهان دارویی به نماتد سیستی کلم، Heterodera cruciferae Franklin 1945 تحت شرایط گلخانه. 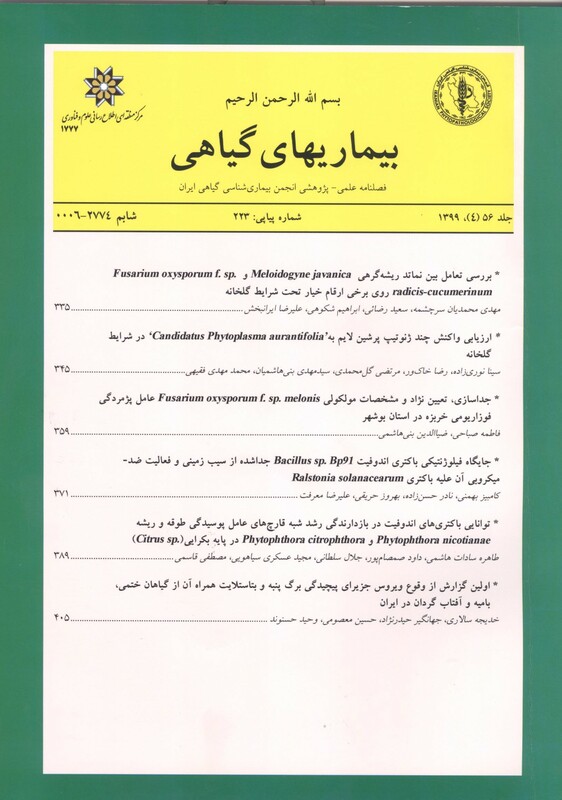 بیماریهای گیاهی, 54(3), 255-258. سمیه خانزاد بناب; حبیبه جباری. "آلودگی برخی گیاهان دارویی به نماتد سیستی کلم، Heterodera cruciferae Franklin 1945 تحت شرایط گلخانه". بیماریهای گیاهی, 54, 3, 1397, 255-258. خانزاد بناب, سمیه, جباری, حبیبه. (1397). 'آلودگی برخی گیاهان دارویی به نماتد سیستی کلم، Heterodera cruciferae Franklin 1945 تحت شرایط گلخانه', بیماریهای گیاهی, 54(3), pp. 255-258. خانزاد بناب, سمیه, جباری, حبیبه. آلودگی برخی گیاهان دارویی به نماتد سیستی کلم، Heterodera cruciferae Franklin 1945 تحت شرایط گلخانه. بیماریهای گیاهی, 1397; 54(3): 255-258. Cultivation of medicinal and aromatic plants has increased in the tropical countries to meet the needs of the pharmaceutical, cosmetics and food industries. Many plants are susceptible to various diseases and pests. Phylum nematoda includes the group of multicellular and vermiform animals, which found in all different habitats. Plant parasitic nematodes are estimated to be about 10% of the phylum. Using of medicinal plants for the human disease treatment is almost universal among non-industrial societies and countries. In current study, in addition to main hosts of cabbage cyst nematode (kohlrabia, Brassica oleracea L. var. gongylodes, and white cabbage, Brassica oleracea L. var. captita alba) that are naturally infected by cyst nematode in vegetables growing area of Tariz, thirteen species of medicinal plants namely Dracocephalum moldavica L., Melissa officinali L., Lallemantia iberica F., Sisymbrium sophia L., Sinapis alba L., Brassica nigra L., Portulac oleracea L., Foeniculum vulgare Mill, Ocimum basilicum L., Alyssum homolocarpum L., Cichorium intybus L., Brassica oleracea var. gongylodes, Vicia ervilia L., Eruca sativa L. were selected and inoculated with the cabbage cyst nematode under greenhouse conditions. The plants were randomly sampled in different phenological stages between germination to flowering periods. The sampled roots roots were stained using lactoglycerin-fushin acid solution and microscopic slides prepared. The results showed that beside positive control plants (kohlrabi) different developmental stages of the nematode were detected in Black mustard (Brassica nigra. L), Yellow mustard (Sinapis alba L.), Turnip (Eruca sativa L.), Alyssum (Alyssum homolocarpum L.) and Soothe (Sysymbrium Sophia L.) roots. The infected plants as weed in vegetable field of the area could increase the spreading of the nematode and the level of yield losses. Meanwhile, the unaffected medicinal plants could be considered as potential rotation candidates for the cabbage.